SanDisk and Toshiba announced today that they are manufacturing 256Gbit (32GB), 3-bit-per-cell (X3) 48-layer 3D NAND flash chips that offer twice the capacity of the next densest memory. The two NAND flash manufacturers are currently printing pilots of 256Gb X3 chips in their new Yokkaichi, Japan fabrication plant. They are expecting to ship the new chips next year. Last year, Toshiba and SanDisk announced their collaboration on the new fab wafer plant, saying they would use the facility exclusively for three dimensional "V-NAND" NAND flash wafers. 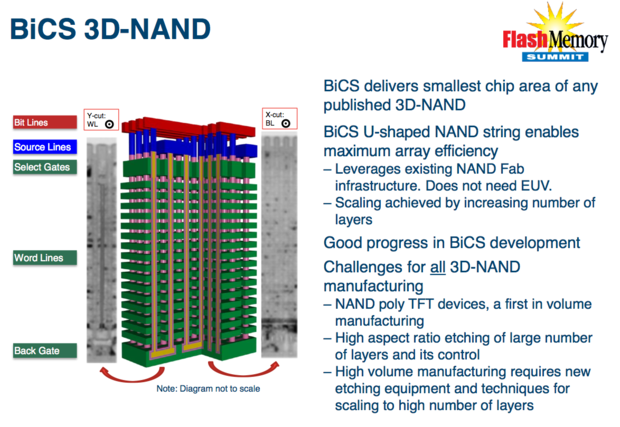 In March, Toshiba announced the first 48-layer 3D V-NAND chips; those flash chips held 128Gbit (16GB) of capacity. The new 256Gbit flash chip, which uses 15 nanometer lithography process technology, is suited for diverse applications, including consumer SSDs, smartphones, tablets, memory cards, and enterprise SSDs for data centers, the companies said. Based on a vertical flash stacking technology that the companies call BiCS [Bit Cost Scaling], the new flash memory stores three bits of data per transistor (triple-level cell or TLC), compared to the previous two-bit (multi-level cell or MLC) memory Toshiba had been producing with BiCS. "This is the world's first 256Gb X3 chip, developed using our industry-leading 48-layer BiCS technology and demonstrating SanDisk's continued leadership in X3 technology. We will use this chip to deliver compelling storage solutions for our customers," Siva Sivaram, SanDisk's executive vice president for memory technology, said in a statement. SanDisk and Toshiba's fab operations in Yokkaichi, Japan where the new 48-layer 3D V-NAND chip is being produced.